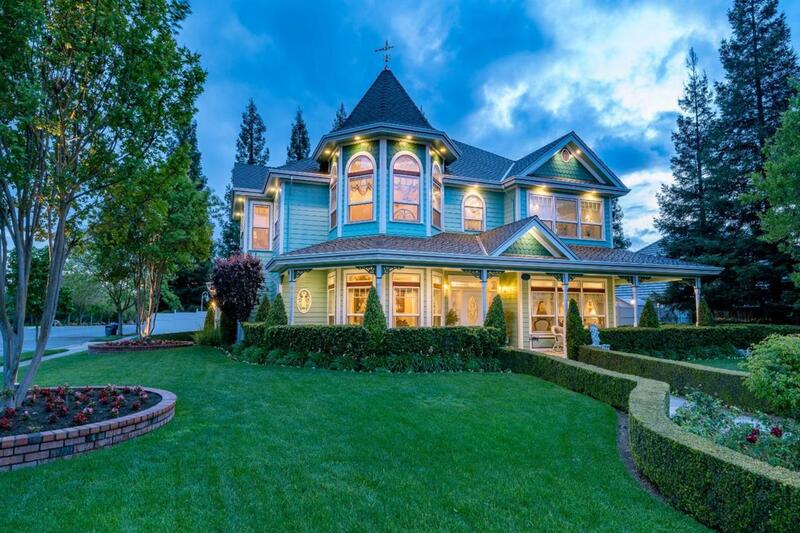 Exceptional true Victorian located on one of Fresno's finest neighborhood's. Attention to detail & the highest quality craftsmanship show throughout this stunning custom home. This upscale home features 4100sf, 4bd, 3ba, w/ a office featuring built in desk & cabinetry, immaculate 3 car garage w/ built in storage & RV power. Upstairs you'll find 3 bedrooms, large laundry room, & plenty of storage. The oversized master suite includes his & hers walk in closets, large bath w/steam shower, & a spacious sitting room complete w/ wet bar . The gourmet kitchen includes a Thermador 6 burner gas cooktop, Bosch Dishwasher, Sub-Zero Fridge, handcrafted Maple cabinetry, beautiful granite, & large island w/ prep sink. The formal dining room features built in soft close cabinetry w/ glass doors w/ lighting. Outside you'll find a large, private, beautifully landscaped backyard w/a spacious wrap around covered patio featuring a hot tub, commercial grade misters & built in barbecue. This is a must view.